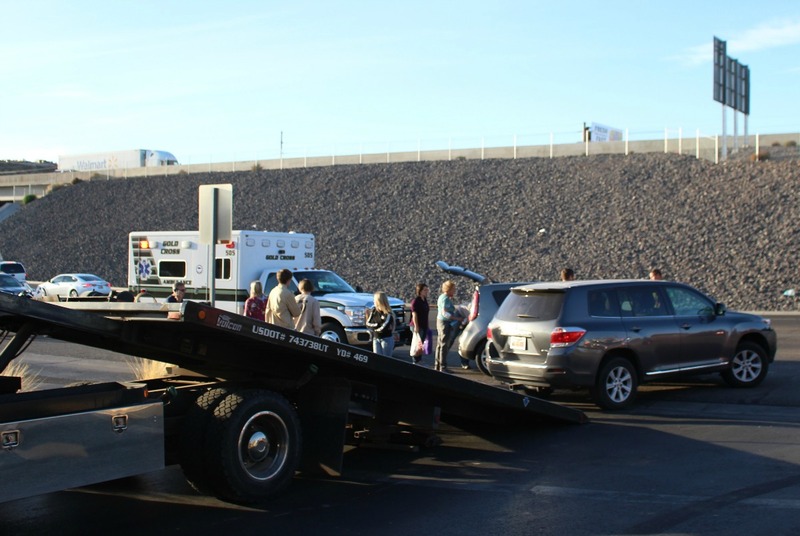 ST. GEORGE — Multiple emergency personnel responded to a two-vehicle crash in front of Red Cliffs Mall Friday afternoon, a scene made more chaotic by passing motorists, blocked lanes and heavier traffic. 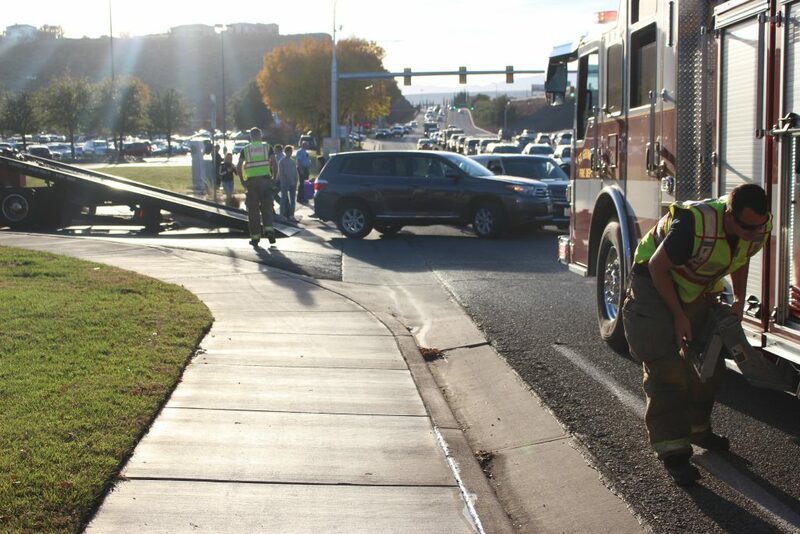 A few minutes before 4 p.m. a two-vehicle crash was reported on Red Cliffs Drive near one of the parking lot exits in front of the Red Cliffs Mall involving a charcoal gray Toyota Highlander and a gray Kia Soul. 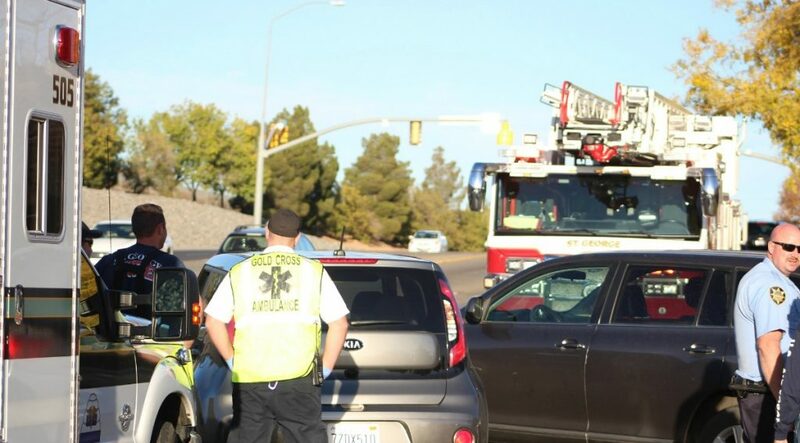 Officers found both vehicles smashed together and blocking the outside lane of Red Cliffs Drive with one passenger in the Kia reporting an injury to her arm, but no other injuries were reported, St. George Police Officer Dave McDaniel said. 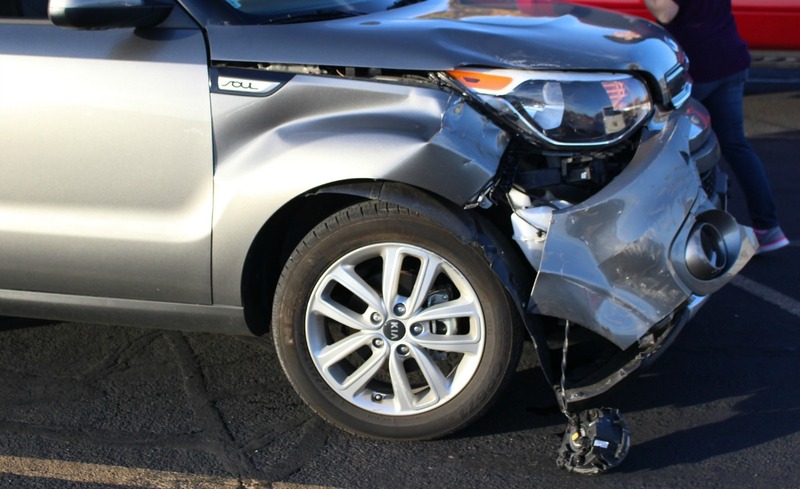 “The passenger in the Kia suffered a small laceration to her arm that was treated at the scene, but she was not transported to the hospital,” he said. Officers learned after speaking with the drivers and witnesses that the Kia was heading east in the dedicated turn lane of Red Cliffs Drive while the Toyota was exiting the Red Cliffs Mall parking lot. 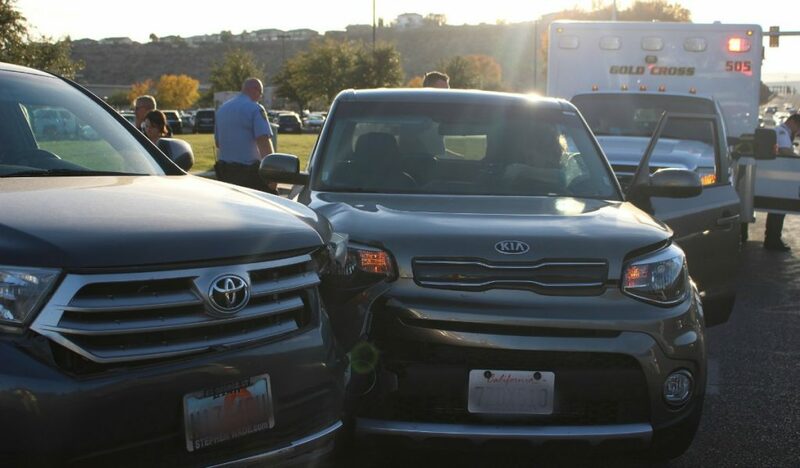 The Toyota driver pulled out in front of the Kia while attempting to turn left from the parking lot, telling officers “he didn’t see the Kia,” McDaniel said. Both cars collided and remained smashed together until responders arrived. Once separated, the two vehicles were towed from the roadway. The couple in the Kia, a vehicle rented in California to make the journey to Utah, was visiting family during the holiday before the crash occurred. 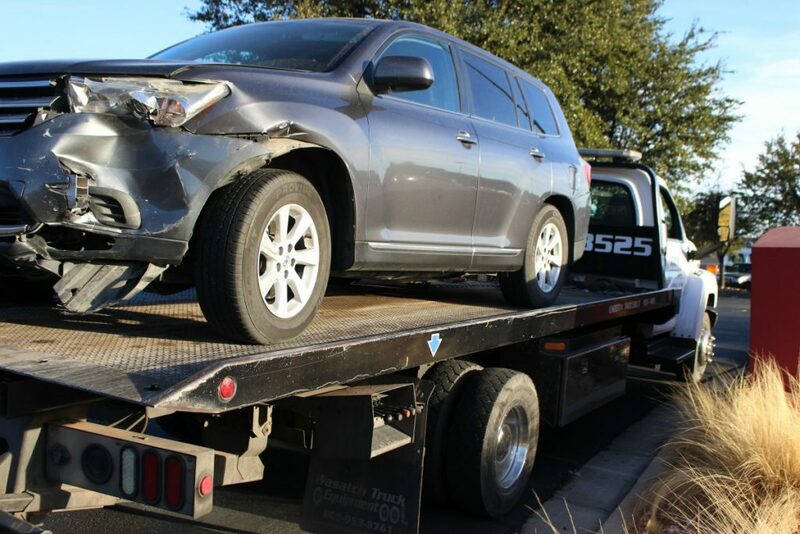 The 16-year-old driving the Toyota was later cited for failing to yield when entering a roadway and for having a teen passenger, which is not allowed under Utah’s teen passenger limitations. A teen driver may not operate a motor vehicle upon any highway or public roadway with any passenger who is not an immediate family member of the driver until the driver has had his driver’s license for six months, or reaches the age of 18, according to the Utah Department of Public Safety. Traffic was diverted away from the crash to allow space for multiple emergency vehicles, officers, firefighters, emergency medical personnel and tow truck operators that were parked in or tending to the scene. Even so, several vehicles attempted to drive through the cordoned off area where responders were working, making the already congested scene even more dangerous. Several vehicles had to be stopped and diverted away from the scene while other vehicles slowed to nearly a stop while passing the area, which created safety issues for responders as well as other cars following behind. McDaniel said that many times drivers see a crash and “drive directly toward it,” instead of moving over to allow them room. He also said drivers should become even more alert when they see that a crash is up ahead and should be aware of other motorists around them and alert to potential hazards. Most importantly, motorists need to “watch the road, not the crash,” he said.